Purchase HCG Sublingual and Get Your HCG Diet Recipes Book for Free! To purchase sublingual for weight loss on Dr. Simeon's protocol you don't need to go any further. You can order HCG from here and get great benefits. Let me explain... Most other places which sells HCG does not give you this awesome alternative. You still have to go crazy allover the Internet for HCG diet menus plan to proceed with your weight loss program. It is a nightmare to everyone involved on HCG diet for weight loss but curiously, nobody tells you! And later on you learn have to invest more money in a lot of additional products. To avoid HCG dieters discouragement and to satisfy their critical needs we have put together an advanced protocol for Dr. Simeon's weight loss system. And guess what? Includes all the basic needs to make your 21 days diet journey successfully and with achievable goals. Now you can purchase sublingual hCG online easily. It is recommended to start with HCG diet phase 1. 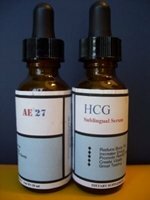 This hCG powder you will purchase online, is the one you are to mix with the enriched proprietary formula AE-27 sublingual HCG serum for oral drops application. It is an improvement to hCG diet treatment and completely free of injections. You can place your order online for phase 1 hCG oral sublingual AE-27 mix at the cheapest cost and get 2 additional products you will have to pay extra money on other providers. To order HCG sublingual online you do not need to create an account to make purchases on our site. Simply click Add to cart to proceed to checkout. If you would like to make your future purchases even faster, you can create an account during checkout. The phase 1 HCG product includes the HCG phase 1 serum mix and the HCG diet recipes book, all together. Please, proceed to purchase your hCG phase 1 diet supplements clicking the Add to cart button below. Worry free HCG diet for weight loss journey! You are going to find here multiple hCG diet recipes and a variety of inclusions to the basic meats allowed on the 21 days hCG diet journey. You only have to worry on preparing and cooking your food. all calories are already balanced to make your purchase sublingual HCG diet successful.